In order to leave feedback for another user, as a Service Provider or a Shipper, only the users who participated in the booked listing/shipment transaction can leave feedback for the other party involved. To maintain the integrity of the feedback system, feedback left for a member is a permanent part of that member’s profile. Feedback comments cannot be edited at a later date. Members should resolve any misunderstandings prior to leaving feedback since most misunderstandings can and are resolved quickly through direct communication. Feedback is one of the most important features of the uShip marketplace. Consistently leaving feedback is essential to the uShip marketplace, and lets both Shippers and Service Providers make decisions when placing or accepting bids. Feedback is always attached to a listing. Read this press release about The Importance of Feedback. Users can only leave feedback for the other party any time after the listing is booked. We recommend users leave feedback after the shipment has been delivered. Feedback can only be left once per listing. However, if a Shipping Customer and a Service Provider are involved with future shipments, multiple feedback can be left per listing. Only Service Providers can receive detailed feedback. The listing status is relative to the user who is viewing it. When a Shipper leaves feedback on a listing, the listing status automatically changes to the "Completed" status. When a Service Provider leaves feedback on a listing, the listing status automatically changes to the "Archived" status. Cancellation comments are different than and distinct from feedback and do not affect the feedback score. The number of cancellations is viewable on the profile page. Feedback can only be left when a transaction is complete. How does feedback work for brokered listings? The Shipping Customer provides feedback to the Broker. The Broker provides feedback for the Carrier. Currently the Shipping Customer cannot leave feedback for the Carrier. However, the Shipping Customer can work together with the Broker to provide feedback for the Carrier involved in the brokered listing transaction. 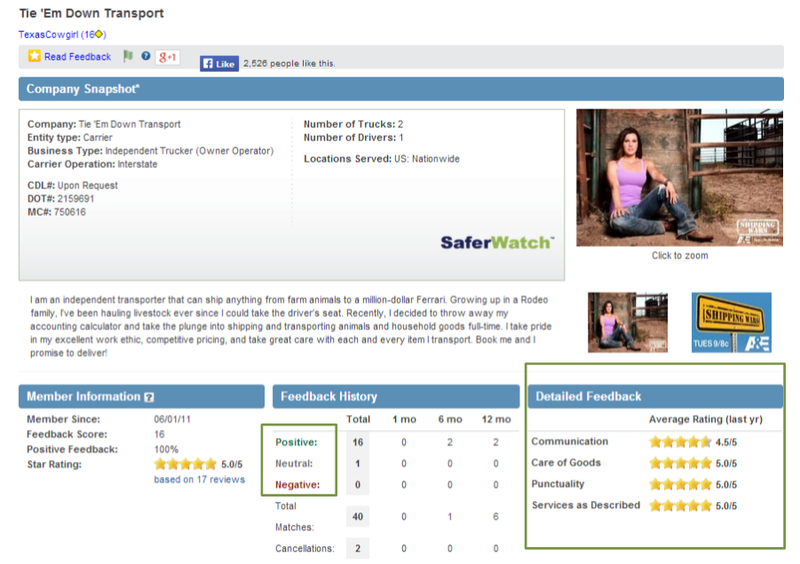 The Shipping Customer would communicate directly with the Broker so that the Broker couples his/her feedback to appear on the Carrier's profile. The Shipping Customer can only leave feedback for the first party that booked the original listing. Please review the most current feedback policy in the User Agreement. For each uShip transaction, the shipping customer and Service Provider are allowed to rate each other by leaving feedback for one another. Feedback consists of leaving one rating (positive, negative or neutral), along with a short comment about your experience. Feedback scores are calculated when another member leaves you positive, neutral, or negative feedback (represented by a +1, 0, or -1 influence on your score, respectively). Each member's overall feedback score is the difference between the number of members who left a positive rating and the number of members who left a negative rating. When a member leaves more than one of a particular type of feedback, for example three positive ratings for another member (for three different transactions), the other member's score only increases by +1. While the score is only increased by +1, each of the comments are made available for the community to read in the profile section. A member can only influence another member's feedback score by one positive, one negative or one neutral rating. For example, if you leave 3 positives and a negative, only one of the positives and one of the negatives will count against the score, netting to provide a score of 0.